As promised, this month we are continuing with our discussion of RealNetworks (http://www.real.com/) RealMedia format. If you tried the 70-second sample video mentioned last month you probably noticed that you had to wait for the entire download of the file before it came up in RealPlayer G2 and started playing. Let's take a closer look at this. The URL is http://www.scpcug.com/realmedia/SCPCUGmtg.rm. Going to this URL will download the RealMedia file SCPCUGmtg.rm which is 181 KB in size. With a 28.8K connection it took approximately 56 seconds to download and the file started playing 5 seconds later. The RealPlayer G2 has no "save" function in it's menu so how can you save the file after downloading and playing it? Look in C:\WINDOWS\TEMP. There you will find SCPCUGmtg.rm. Copy or move the file to another directory and you have your very own copy that you can play whenever you like (without connecting to the Internet) just by double clicking on it. So how does streaming video work? Streaming is where the video will start playing after some seconds of buffering and continue playing while the remainder of the file is still downloading. I have a program which I believe works only for those of us still using the original Windows 95. I find it very useful for monitoring what is going on as far as transmitting and receiving data through my modem. It's called NetMon. With this program I can clearly see that streaming is indeed happening. Comparing the RealPlayer G2 SCPCUG meeting graphic with the Internet Connection Performance (NetMon) graphic shows that RealPlayer G2 has already played 13.7 seconds of the 1 min 11.2 sec SCPCUG meeting clip while NetMon shows by the red "receive" graph that the file is still downloading. NetMon works by interfacing with the ModemLights icon in the System Tray at the right side of the TaskBar. When I click on the ModemLights icon, up pops the graphical representation (with speeds) of what is being sent and received through the modem. NetMon ver 1.1 is still available from the ZDNet Software Library at http://hotfiles.zdnet.com/cgi-bin/texis/swlib/hotfiles/info.html?fcode=000ATX&b=. Guess that was a bit of wandering so let's get back to the topic at hand. This streaming thing puzzled me for a long time. I would go to a web site, click on a RealMedia file, the file would stream down and play but if I went to the WINDOWS\TEMP folder to find the file the only thing there was a 1 KB file with a ".ram" extension. Double clicking on that while on the web would start the original file downloading and streaming again. It was not until I started playing with RealProducer G2 that I began to figure out the secret behind streaming. Basically what happens is if you just want to have your file download and play without streaming you can create it in RealProducer G2 (http://proforma.real.com/mario/tools/producer.html) and post that file to your web site. That's what I did for the file SCPCUGmtg.rm. If I want to stream this file I have to create another file, in this case SCPCUGmtg.ram. RealProducer G2 will also create this for you but you have to fill out some forms with information about your server and where the files will be located. It will also create a separate HTML page for you so all of this can be published to the web. I found this all a bit confusing. I find it easier to just use my FTP (File Transfer Protocol) program WS_FTP95LE (now called "WS_FTP LE5.06" and available free for non-commercial use at http://www.ipswitch.com/cgi/download_eval.pl?product=WL-1000) to post the files on our Users Group web site in the sub folders I created. I know the sub folder architecture and therefore I know where the files should go. The streaming works by first invoking the .ram file which is a pointer to the .rm file. In other words the .ram file in effect clues the RealPlayer G2 that the .rm file it is about to find should be streamed. My dilemma was what exactly is contained in the .ram file and can I generate it myself or am I locked into using RealProducer G2 to generate it. Right clicking on a .ram file generated by RealProducer G2 gave me the option to open it but that only brought up RealPlayer G2 which started looking for the .rm file. I have the program QuickView Plus (http://www.inso.com/qvp/index.htm) as another option when I right click a file. Trying that brought some reality. It showed that the file contained the path to the .rm file (in our example from above, http://www.scpcug.com/realmedia/SCPCUGmtg.rm) but did it also contain some hidden code I was not aware of? That question plus how can I generate this .ram type of file myself was still to be answered. In summary, what I found is the .ram file is nothing more than a plain text file containing only the path to the .rm file. You can generate a .ram file with NotePad or WordPad. Now you know the secret of streaming! Again taking our example, go to the URL http://www.scpcug.com/realmedia/SCPCUGmtg.ram. Invoking this link starts the process. You will see the RealPlayer G2 pop up and approximately 10 seconds later it will have a picture. It will continue buffering for another 29 seconds before actually starting to play. This is a relatively small file at 181 KB so the savings between streaming and non-streaming (approximately 22 seconds) is not all that great. But if you are accessing a large clip, for example the 15-20 min daily audio clips at CNET Radio (http://news.cnet.com/news/0-1012.html), there is no way you would hang around for the whole thing to download before playing. Another thing I wanted to mention about the RealPlayer G2 which you may not be aware of is each file you play could have clip information with it. In your RealPlayer G2 go to "View" and make sure "Clip Info" is checked. This brings up an integrated Clip Info window which scrolls to tell you the title, author, copyright, and any other information the creator wants you to know. If you click on the script "i" in the purple circle at the right edge of that window it will bring up a separate window containing all of the clip information. This is information that can be entered when creating the clip using RealProducer G2. Next, I would like to clear up a little confusion. 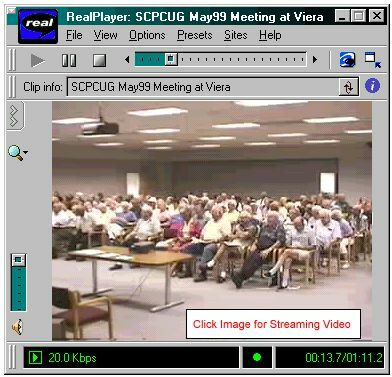 A few of our members have written saying the link I have cited in a past Web Master Wanderings column for obtaining RealPlayer G2 and the link off of the RealPlayer G2 button on our SCPCUG Home Page takes them to a page where RealNetworks wants $29.99 for the player and thus it's not free. Welcome to "marketing on the web" which means "read everything very carefully"! When you click on the RealPlayer G2 button on the SCPCUG Home Page it takes you to this page, http://www.real.com/products/player/index.html. Look for the line that says "The RealPlayer G2, free, plays all Real content" and click the link in that line. Stay away from anything that says "Plus" on these pages or you will be buying the plus version for $29.99. 1&lang=en where you fill out the form and click on the "Download FREE RealPlayer" button. Again stay away from the version with 3D audio and bass boost unless you want to spend $11.95. Finally, for the past few months I have been mentioning the RealPlayer G2 as a "must have" item for your Internet Adventures and you may be wondering why I like it so much. Surely there are other products around that do similar things like streaming audio and video. Well there are, but RealPlayer G2 is at the top of the list. For a comparison of the major products out there (along with their pros and cons) I invite you to check out an analysis of Web Audio and Video by PC Magazine Labs at http://www.zdnet.com/pcmag/stories/reviews/0,6755,2322409,00.html.